Announcer:	GEICO presents Our Town, Season Two. A 30 minute podcast produced by Best Bark Communications, a small but fierce client-centered marketing company powered by decades of experience and well-established business networks. GEICO. 15 minutes will save you 15 percent or more on car insurance. Now, here’s your host, Andy Ockershausen. Janice Ockershausen:	Hi, this is Janice Ockershausen, the executive producer of Our Town, and we wanted to look at Season One. This is a transition piece, and we wanted to let people know that we are finishing Season One and starting Season Two. Andy Ockershausen:	We had 53 guests in our first season, were going to have at least 40 more in our second, and we hope you’ve enjoyed listening to their stories. You know, we’ve got stories of success, of failure, some happiness, some sadness, prosperity, we had people that failed that were on this show. We have a homeless person who talked about the city and what she goes through. It makes this Our Town tick, the people. Janice Ockershausen:	You know what? It makes it personal. What has been really exciting for me, listening to every podcast then re-listening to it and presenting it, it’s a wonderful thing because you have experienced with these people, all hand-picked people, all hand-picked guests by either you or me, and we know them, we have lived through some of these exciting times, and it was so interesting to hear it from the horse’s mouth. Andy Ockershausen:	Well you know, Janny, that has been a big revelation to me. For whatever reason, I got a lot of stuff in my cranium. I guess I absorbed and kept everything I ever heard of, and it’s like a computer, but to have people talk about things that I grew up with, and to be able to understand what they’re saying, has been a great boon to me and to them. I can get questions and ask questions of people that think I don’t know, and I know because I was there. Janice Ockershausen:	Yeah, you’re incredibly well read, and your memory is unbelievable. It’s the little details that you’re able to connect with your guests that make it so interesting and so full, and so flavorful. The texture of Our Town is remarkable. Andy Ockershausen:	The people of Our Town have made it so great over the 50 years of that we are talking about, and we’ve got more to come, but the guests that we’ve had, and they don’t really feel like guests. They feel a part of Our Town, which makes me feel great. Janice Ockershausen:	They’re our family and our friends. Andy Ockershausen:	Absolutely. They’re great friends. Janice Ockershausen:	If you look back at a little bit of the list of people we had, were Bill Regardie, a fantastic interview, Cary Hatch, Sonny Jurgensen, Dexter Manley, Lon Anderson, Wendy Rieger. Andy Ockershausen:	You know, Tommy Loverro, that he just started his own show. Janice Ockershausen:	With Andy Pollin. Andy Ockershausen:	Andy Pollin, and listen, Irene Pollin called us to be on with us. You know, we’ve had people like Frank Herzog, boy nobody forgets him. Paul Berry, my god, Paul. Christine Brennan, Johnny Holiday, golly what a great talent. Janice Ockershausen:	We had Charlie Brotman before he was Charlie Brotman. We had Henry Sacks, our dear friend, and probably the most meaningful guest for me, I guess symbolically, was that we based Our Town on the principles of The Harden and Weaver Show, our first guest and our last guest. Actually he was the first one that we interviewed, and the last one we out on for Season One, was our dear friend Frank Harden. Andy Ockershausen:	For 94 years old, and such a great talent and a big part of Our Town, as Harden and Weaver and Janny was their producer, she knows what we’re talking about. We can’t go anywhere and not remember Harden and Weaver, because people never forgot them and they never will. Janice Ockershausen:	That’s right. We are so grateful for all our guest and you could actually still listen to them because they’re in the stratosphere as Andy calls it, in podcast land, and you can always hear our podcast, all 53 of them from Season One, at ourtowndc.com. Right now, with Ken our technical director who’s been with us through the whole thing on WMAL Radio who hosted us, we’re currently working on season two so can you give us a couple of highlights from the people who are upcoming? Andy Ockershausen:	Well I just heard this morning from Gordon Peterson. He agreed to be on the show. If you don’t remember Gordon Peterson, you haven’t lived in Our Town because he was Mr Channel 9. Those kind of people are coming back to us, and they want to be on. Donald Graham, the man who owned and sold the Washington Post, he’s in our second season. They all have great stories and what makes me so happy is, that WMAL joins us all together and we’re still doing it now. Thanks to you Janny, and thanks to Ken and to all the people that work with us. We’ll be looking forward to May when we start season two. Janice Ockershausen:	Our launch date for season two is mid May. Janice Ockershausen:	As you said, if I was listening, we are kicking off season two in mid May, and we invite you to join us again. Until then, thank you everybody. We love Washington and this is Our Town. Andy Ockershausen:	We love Our Town. Announcer:	You’ve been listening to Our Town season two, presented by GEICO, our hometown favorite, with your host Andy Ockershausen. 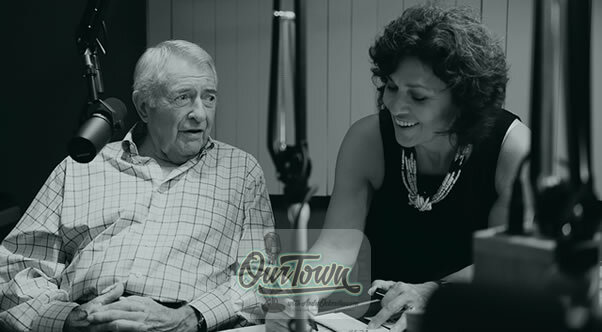 New Our Town episodes are released each Tuesday and Thursday. Drop us a line with your comments or suggestions, see us on Facebook, or visit our website at ourtowndc.com. Our special thanks to Ken Hunter, our technical director and WMAL Radio in Washington DC, for hosting our podcast, and thanks to GEICO. 15 minutes will save you 15 percent or more on car insurance.